Curried Lentil Farro Soup Bento, a photo by sherimiya ♥ on Flickr. This winter has been extremely cold around these parts -- 30s at night and only 40s-50s during the day! It definitely calls for warming foods at lunch time, such as those that can be packed in a thermal food jar. Today I made curried lentil barley soup for protein-packed nutrition. For TinySprite I left it a little "dry" to make it easier to eat without spillage. 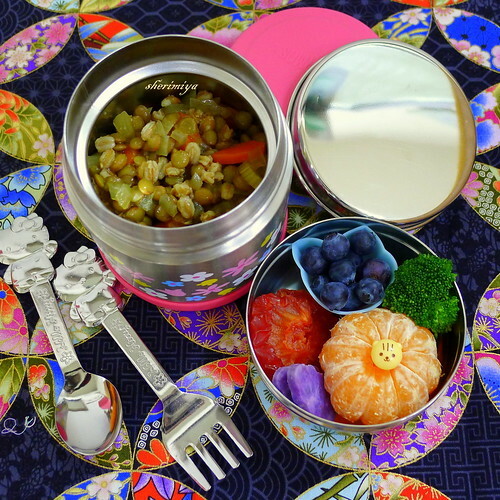 She toted along a little side container containing: a mini cup of blueberries, steamed broccoli and Okinawan sweet potato, a satsuma mandarin and a dried pluot. 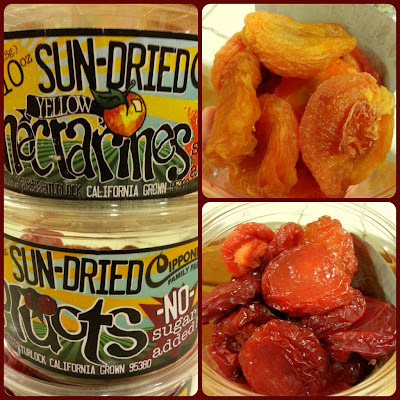 My favorite local stone fruit farm sells the dried version of my favorite summer fruits so we can pretend it's peak summer. They don't add sugar but the pluots, nectarines and peaches are unbelievably sweet. Just one will overwhelm your tastebuds with a sublime explosion of sweetness. Can you tell I like them a lot? Heat the oil in a large soup pot over medium-high heat, and saute onions, celery and carrots until softened, a few minutes. Add the curry powder; stir until fragrant. Add farro, lentils and broth. Bring to a boil, lower heat, and simmer covered for 30 minutes or so. Taste; add salt or more seasoning as desired. You can also add other vegetables too, like squash or potatoes, or add more of the ones in the recipe as you like. It's quick and easy. I added extra cumin (because I like it). You can also top with yogurt mixed with lemon juice. I totally love lentils and will have to try this. Are the blueberries dried too? I've never heard of pluots. Will go and google them at once. Nope, the blueberries are fresh. The local fruit farm I love carries pluots (a plum apricot hybrid), apricots, peaches, nectarines, and pears -- in summer. They happily keep some to dry so that the diehards like me can be satisfied in the dead of winter. There are several different pluot varieties in this area (also some called apriums) but the best ones are the mottled reddish-green skinned, DARK red-fleshed types. If you can imagine them dripping with syrupy sweetness in summer, you get an idea of how delicious this dried version is. My kids consider them candy, and we can use them as "rewards", heh. Looks so yummy! And I love the adorable HK silverware! What a vibrant, healthy composition of foods, color and sweet Sherimiya style :)! Thank you for the sweet comment, Jenn!